joint pain, and conjunctivitis (red eyes). The illness is usually mild with symptoms lasting from several days to a week. Severe disease requiring hospitalization is uncommon. Most people infected with Zika virus never know they are sick. Zika is carried by the Aedes species of mosquito which can be found in Georgia; however, no locally transmitted Zika cases have been reported in Georgia which means that Zika is not yet in our mosquito population. Cases have been reported in travelers returning to Georgia from areas where Zika is known to be in the mosquito population. Click HERE to see where travel-related cases Zika virus have been confirmed in the state of Georgia. Zika Info On-The-Go: Sign up to receive Zika updates for your travel destinations with CDC’s new text messaging service. Text PLAN to 855-255-5606 to subscribe. Pregnant women or women trying to get pregnant should not travel to areas where Zika virus transmission is ongoing. Pregnant women who have traveled to these areas should consult their physician immediately. Health care providers should ask all pregnant women about recent travel. Zika virus can be passed from a pregnant woman to her fetus during pregnancy or around the time of birth. Zika infection during pregnancy is a cause of microcephaly, a severe birth defect that is a sign of a problem with brain development and other severe fetal brain defects. Click HERE for Zika questions and answers. The best way to protect ourselves from mosquitoes is to prevent them from breeding. 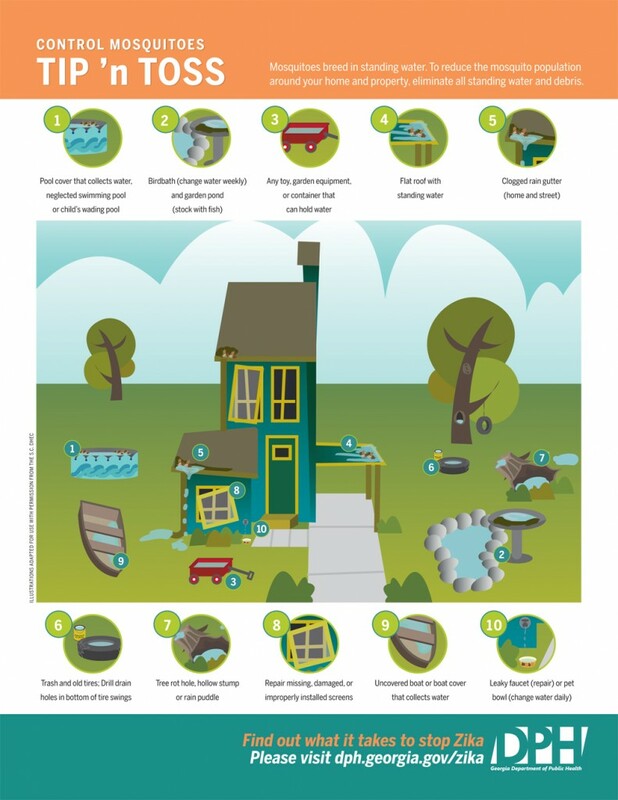 One of the most effective ways of preventing the spread of mosquito-borne viruses is controlling the mosquito population by eliminating standing water around the home and in the yard. Mosquitoes lay eggs in water; just a bottle cap of water is all they need. After every rainfall – or at least once a week – tip out water in flowerpots, planters, children’s toys, wading pools, buckets and anything else around your yard that can hold water. If it holds water and you don’t need it (old tires, bottles, cans), toss it out. Keep vegetation cut low to prevent landing sites for adult mosquitoes. For containers without lids or that are too big to Tip ‘n Toss (bird baths, garden pools), use larvicides such as mosquito dunks or mosquito torpedoes and follow the label instructions. Larvicides will not hurt birds or animals. Make sure to keep doors shut and cover windows with screens. Repair or replace any screens with holes in them. 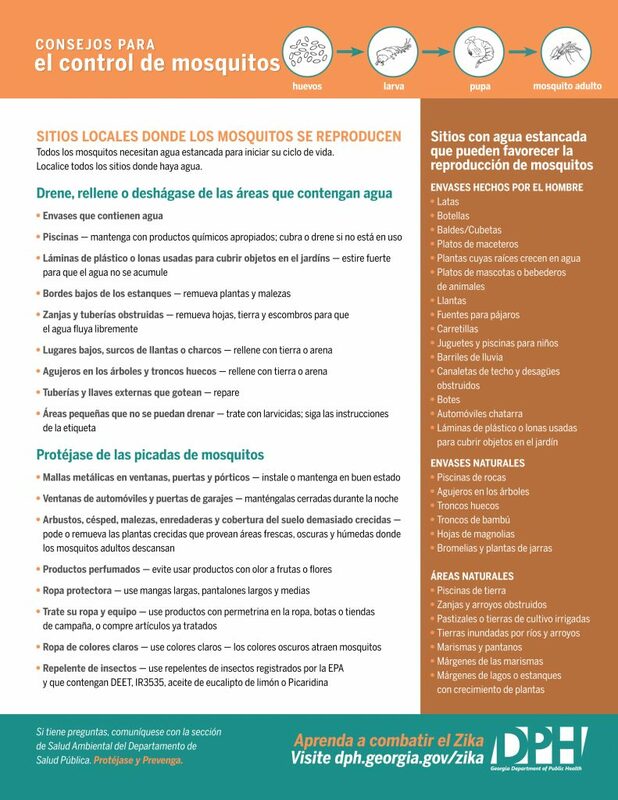 Use EPA-registered insect repellents containing 20%-30% DEET, Picaridin, IR3535, or Oil of Lemon Eucalyptus when outdoors. 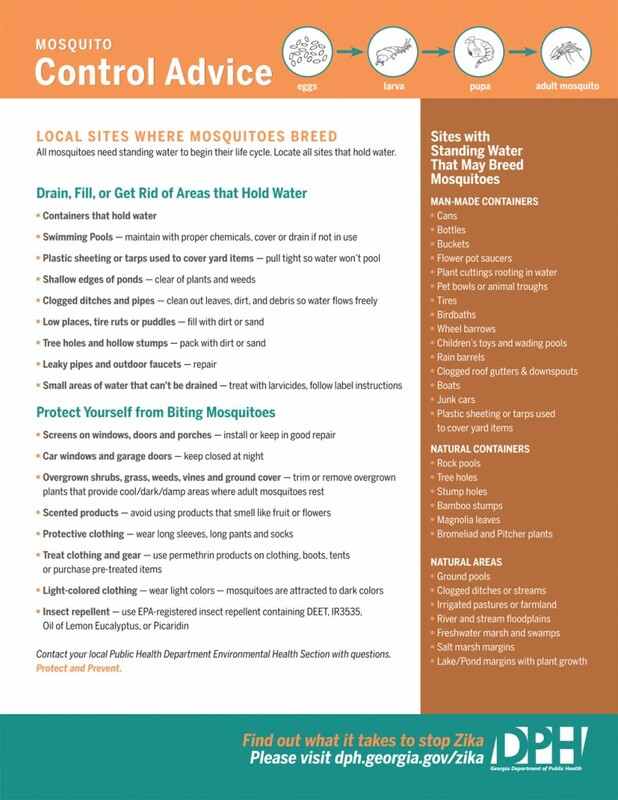 Wear light colored clothing with long sleeves, long pants and socks to help prevent mosquito bites.